Personal Training - Welcome to Burke Racquet & Swim Club! 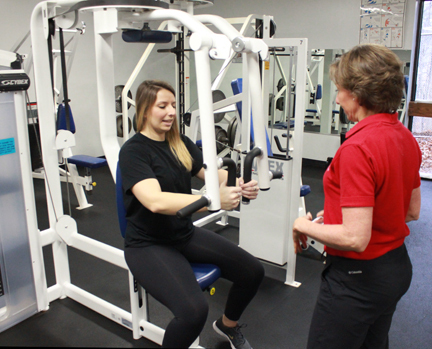 BRSC has nationally-certified personal trainers and post-rehab conditioning specialists on staff to help you accomplish your fitness and health goals. They will design a program to fit your specific needs. Call Lynnda Gendron at 703-250-1299 to schedule an appointment or for more information. Individual or group sessions two or three times per week…once a week…or once a month! *Package sessions must be paid in advance and are good for one year from date of purchase. A fitness consultation consists of an evaluation of your resting heart rate, blood pressure, body fat percentage, muscular strength, flexibility, cardiovascular fitness and presentation of a personalized exercise program. Includes a fitness consultation and 4 personal training sessions. Package sessions must be paid in advance. Post-rehabilitation conditioning provides an exercise program for clients who have musculoskeletal neurologic, and cardiovascular disorders. Have you been in physical therapy for treatment of an injury and are still recovering? Our expert on staff can customize an exercise program to address these specific concerns to help you increase your level of functional conditioning. Post-rehab protocols are developed by physical therapists and orthopedic surgeons to provide safe and effective fitness programming for our clients. All of our conditioning sessions are supervised one-on-one by post-rehab conditioning specialists. Our Breast Cancer Exercise Specialist Lynnda Gendron is qualified to assess, design, and implement individual and group exercise and fitness programs for those who want to regain strength and fitness after completing breast cancer surgeries and treatments.